feel good time: i might cut my ear off like van gogh. Did you know that Van Gogh cut his ear off? Mainly because the man was a little physiologically insane, but I think I am almost able to relate to the poor guy because I too, am about to cut my ear off due to insanity. No, I am not insane but procrastination has taken me there. Procrastination: that is the most devilish word and it has taken control of my soul. Finals are in three weeks, and I have yet to complete eight paintings. Four being abstracts, one being the size of my house which I will attempt to paint the Don Ceasar Hotel in Flordia, and the other three, well pretty much three pieces of crap because it's for a class that sadly I could give a rip about. Not to mention I have a research paper to write about Contemporary Pop Art and then explode my brain with all the amounts of information I will cram into it for my Art History Test next well. Crud. And I just realized, I have a portfolio to put together ASAP for my Senior Seminar class. If my mom is reading this right now, she may have a heart attack and want to shake me wondering what the heck I have been doing all of this time! I don't know what I have been doing. I mean, I finished my portrait series, which I thought was a job well done and man was I on a roll. But once I finished that, I forgot that I had another load to get done. The work never ends and I am full blown about to reunite with my Carpal Tunnel. How will I pull this off? My dining room is overflowing with paintings. I might as well clear them out and move them into the studio at school and bring a sleeping bag along with me and move on it. Goodbye to the Zoo and goodbye world, you will not be seeing me until the end of April. Bless my soul and wish me the best of luck. I'm going to make this work, one way or another. 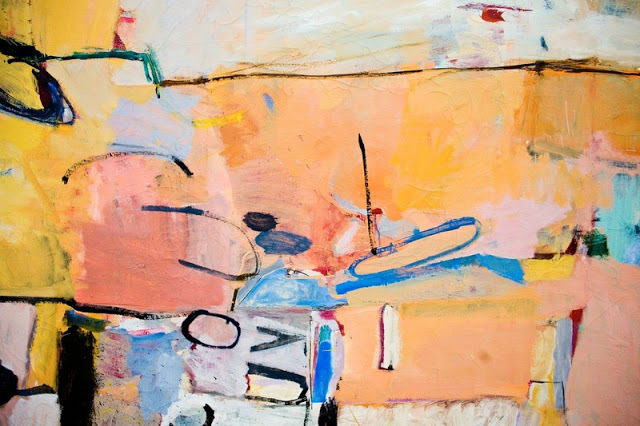 On a happy note, here is one of my favorite abstract painters above , Diebenkorn with his Berkeley Series. #3 in particular is one of my favorite of the series. If I ever was able to gather such beautiful wet on wet paint like he did, my life would be complete.